I am not really one to make New Year’s resolutions, not because I think they’re pointless, I’m just not a fan of the hype surrounding quick fixes for happiness, weight loss, or twelve-step behavior modification miracles. This year I’m going to make an adjustment to my life metaphor. We all have a life metaphor; a lens through which we view the world. This deeply held, unconscious belief determines how we experience everything that happens within and around us and is a powerful determinant of happiness and contentment or stress, depression and anxiety. The New Year can often bring a mixed bag of emotions and memories for many of us. Some may have experienced a year of joy and healthiness and look forward to an even greater one emerging ahead. Others may have journeyed through one hardship after another. This year, I’m refocusing my metaphoric lens so that I can view the world with a greater conviction for hope. We’ve all faced our share of adversity but through it all, a flickering glimmer of hope always remains. Hope is a sustainable and renewable source of energy. The dilemma is remembering to access hope, nurture it, and pass it on. We, as humans, are all wired to connect. Therefore, hope within one holds the potential hope for a least two. If we all extend the works of our hands and the meditations of our hearts, we might just lighten the darkest corners of each other’s hearts. We have packed this winter issue of SignatureMT full of hope and inspiration. We hit the ice with Eagle Mount volunteers for what might look like an average game of hockey. But this competition’s got a twist. Children and adults with disabilities gear up with not only a sled, two sticks, a puck and welcomed mobility but more importantly, a coveted feeling of inclusion. We head to the Fairfield Bench where two Kalispell natives are building their field of dreams and introducing the aroma of mint and dill to the barley capital of the world and if you are looking for a little education in the art of handcrafted hooch, look no further than Headframe Spirits in the Butte. Find out how one town’s past is taking business owners, John and Courtney McKee to new heights – figuratively and literally. If you haven’t had the pleasure of dining out in Italy, Chef Davide Guilani, owner of Trattoria Bella Roma in Helena, promises to deliver the aromas and flavors of the Mediterranean right to your table… all with old world charm. 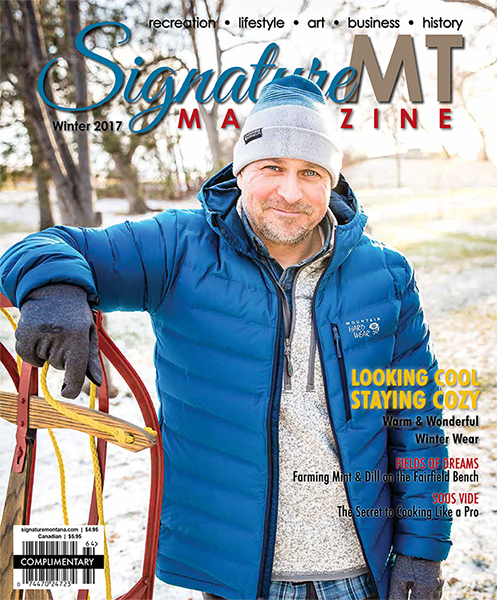 This, of course, is just a sampling off the editorial menu we’ve lined up, so kick up your feet, wrap your hands around a warm cup of Joe and enjoy this winter issue of SignatureMT magazine.